Waterproof and breathable Rip Stop nylon shell with sealed seams is rated MVM 5000 for maximum breathability. Aqua-Barrier under-the-helmet hood to help eliminate seepage in the collar area (US patents #8,156,573 and #7,779,485) and hides under the collar. Chest map pockets feature waterproof zippers, Tour Master's Scoop Vent System and a mesh backing so they can be opened for ventilation when appropriate. Waterproof zippered underarm exhaust vents allow warm air to exit. 3M Scotchlite® reflective piping and TourMaster's signature reflective triangles help increase visibility at night. 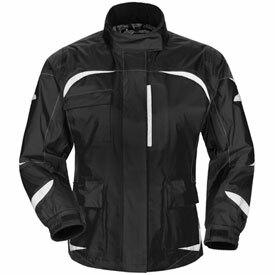 Includes a jacket to pant zipper attachment that matches perfectly with the Tour Master Sentinel Rain Pants. Shock cord waist adjustment seals the sweep, providing a tailored fit. 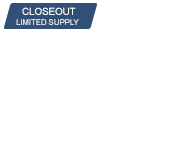 Full wind flap and Velcro® main closure keeps moisture sealed out.